The panic we suggested would occur in our report last month has enveloped the credit markets. “Real-estate loans, not failed stockbrokers’ accounts, were the largest single element in the failure of 4,800 banks in the years from 1930 to 1933.” Homer Hoyt. One Hundred Years of Land Values in Chicago. “At times like these, also, it becomes clear that bank deposits are not really money- even on a paper, let alone a gold standard- but mere money-substitutes, which serve as money ordinarily, but reveal their true identity when nationwide confidence begins to collapse.” Murray Rothbard, America’s Great Depression. While bank deposits up to $100k are insured, the FDIC is under no time restraint to pay depositors back. Similarly, many hedge funds have halted withdrawals “tying up tens of billions of dollars for an indefinite period.” Due to FDIC backlogs, we expect that bank depositors will not have access to their cash when it is time to benefit from bargain prices. As seen in the chart below, the Dow Jones Industrial Average has been tapping on the floor that was once the ceiling of 2000. While we could have a short-term bounce in the DJIA, a break of this level would be significant. 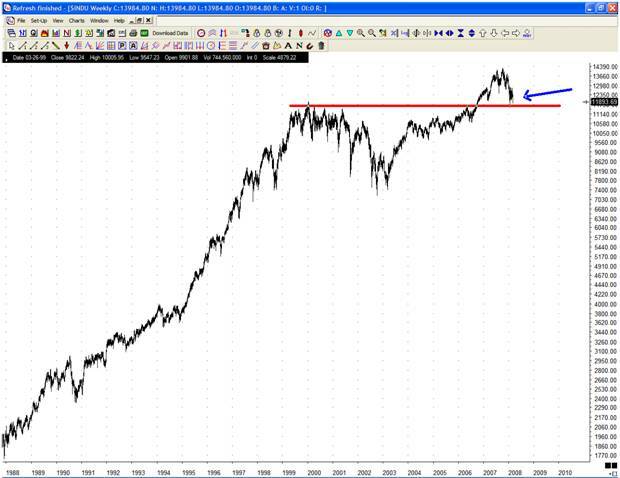 Citigroup’s stock price (shown below) is merely leading the broader market index. As assets fall, investors are seeking the haven of U.S. Treasury Bills, evidenced by the plunge in the yield. But what about the fall in the U.S. dollar? 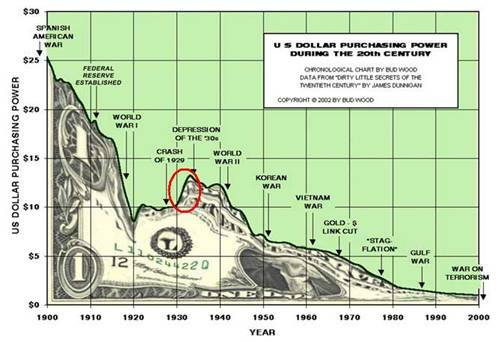 There is a widespread belief in the continued fall of the dollar and the chart below shows why. For most of recent history, the U.S. Dollar has lost purchasing power. But, if you look carefully, the only significant rise of the last 100 years occurred during the deleveraging economy of 1930-1933. 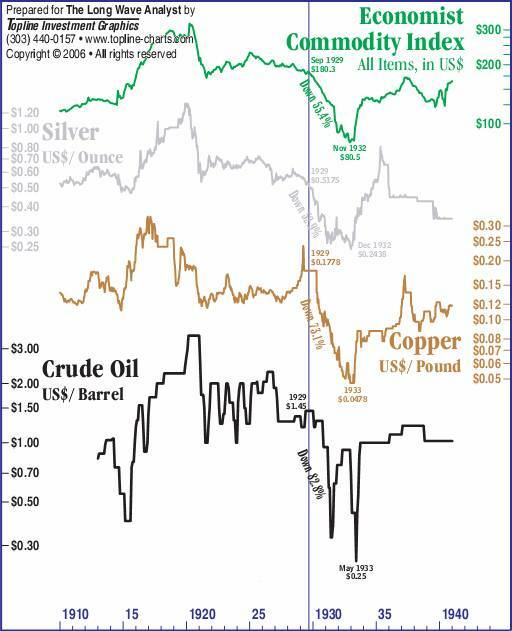 The rise in the value of the U.S. Dollar during the 1929-1933 period was also reflected in the collapse of various commodity prices. The “dollar was backed by gold” is the excuse given by most goldbugs for the dollar’s strength during this time. This argument fails to recognize that the international reserve currency of the day, the British pound was separated from its gold-backing in 1931. 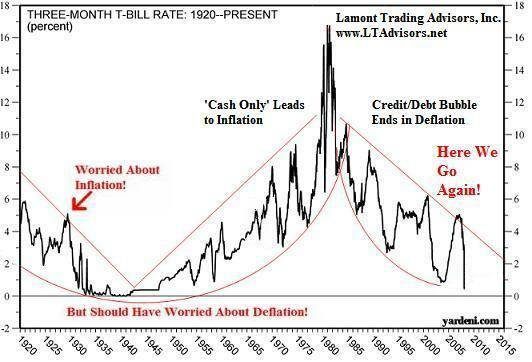 After quickly losing 30% in value, Great Britain subsequently fell into a deflationary depression. 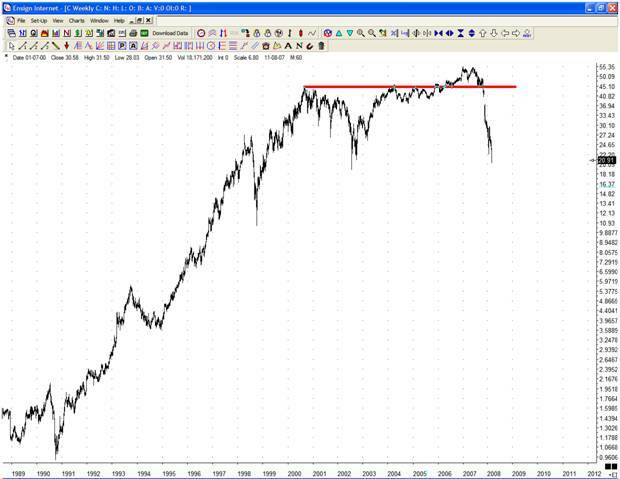 Coincidence or not, the U.S. Dollar has fallen roughly 30% since 2000. In addition, actions by the Fed during boom times are seen as market saviors (such as the 1998 LTCM deal). But interventions during down moves are at first met with approval but ultimately viewed as making things worse. 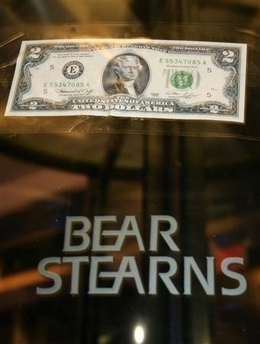 As the article states, investors are concerned that the wild-eyed Fed (on the excuse to save the system) could force financial institutions into deals like the Bear Stearns buyout. So why would investors hold financial stocks? Instead of bailing out banks, the Fed’s actions create more selling, panic, and fear. It’s all about investor perception, which the Fed cannot control. While we should expect rocket-launched (oh, they’ve saved us!) bear market rallies, eventually Wall Street Firms will run into more troubles. Investors holding securities in margin accounts at troubled firms will find that at best they will not have access to funds, at worst they will learn new words like ‘rehypothecation’ and ‘arbitrament.’ If you have a friend or relative with funds at these institutions, alert them of their precarious position. They’re Selling, Mortimer - Why, That’s Ridiculous!